Dr. Clark takes care of his teeth too! Dental cleanings/care can be intimidating for kids and parents. The staff and the doctor are A++ and they have always been kind, respectful, professional and thorough. I would highly recommend to anyone looking for a pediatric dental clinic! Childhood dental habits establish the foundation for oral health during adulthood. By training your children about proper oral hygienic habits at an early age, you can set them up for a lifetime of good oral health. Even before the teeth erupt in your child’s mouth, the gums should be gently cleaned each day. 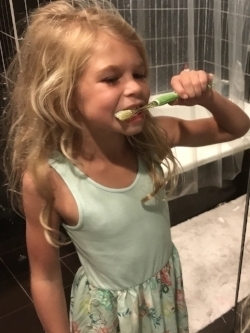 Twice-daily brushing (after breakfast and before bedtime) with a soft-bristled toothbrush and fluoride toothpaste should begin as soon as the teeth break through the gums, although the teeth may initially be cleaned using water rather than toothpaste. As your child gets older, it is safe to use children’s toothpaste, as recommended by your dentist. Brush all of the tooth surfaces to remove food particles and plaque. You should also brush the top of your tongue to eliminate bad breath and bacteria buildup. The surfaces between teeth are impossible to reach with a toothbrush, so the best way to clean them is by flossing. The frequency of flossing is like brushing and ideally after each meal, though one time a day (before going to bed) is the minimum necessary. Cut a piece of waxed dental floss (approximately 12 to 18 inches). Wrap both sides of the floss around your middle fingers. Using your index finger and thumb to pinch the floss, only leave about 1 inches to work with, gently glide the floss in between your child's teeth one by one. When flossing, make sure you are not cutting the gums. In the space in between teeth, GENTLY press the floss against each side of the tooth (curve like a ‘C’) and move it up and down. Then move to the opposite surface of the adjacent tooth. Scientists noticed that children who were raised in areas with natural fluoride in drinking water had fewer cavities than children in other areas. Fluoride absorbed by your body when teeth were forming (during mother’s pregnancy to early childhood) integrates into the structure of enamel and makes it stronger. Depending on the level of fluoridation of the water in your area, we may prescribe a fluoride supplement for your child. Ensure your child swishes fluoride drops around the mouth before swallowing, lets fluoride tablets slowly dissolve in the mouth or chews the tablets and spreads them around the teeth with the tongue. 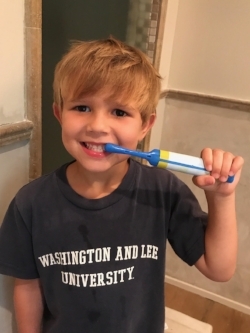 The best time to take fluoride supplements is after brushing at night, right before bedtime, so the fluoride can coat the teeth and be more effective for a far longer period of time while your child sleeps. Sealants are thin layers of resin that are placed on the pits, fissures, and grooves of molars to prevent decay on these surfaces. The majority of decay on back teeth starts in the grooves and pits of chewing surfaces, especially during the first few years after their eruption from the gums. Sealing these surfaces with resins (Sealants) prevents this kind of decay. Sealants are one of the most effective methods of preventing decay on the surfaces where they are placed. Although it is still a possibility that decay may develop on surfaces in between teeth, sealants significantly reduce the overall chance of having cavities. My child had a great experience! There were no tears the day before when I told her about her dental appointment. Dr. Thomas and his assistant were great, as always. She was talking about the “sugar bugs” (brushing was much easier this morning) the morning after her visit!